BUSHXHB, the 2nd June 1933. Q. AT All OIL GOK CESSION . Reference correspondence ending with this Residency A diplomatic office of the British Government established in the provinces and regions considered part of, or under the influence of, British India. 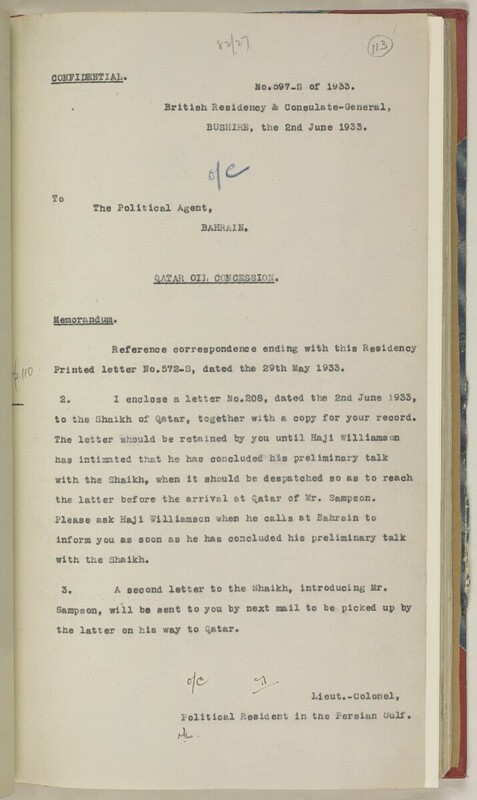 Printed letter No.572-S, dated the 29th May 1933.
to the Shaikh of qatar, together with a copy for your record. the latter before the arriv&l et ^.atar of Mr. Sampson. 3, A second letter to the Shaikh, introducing Mr.
the latter on his way to s^atar.